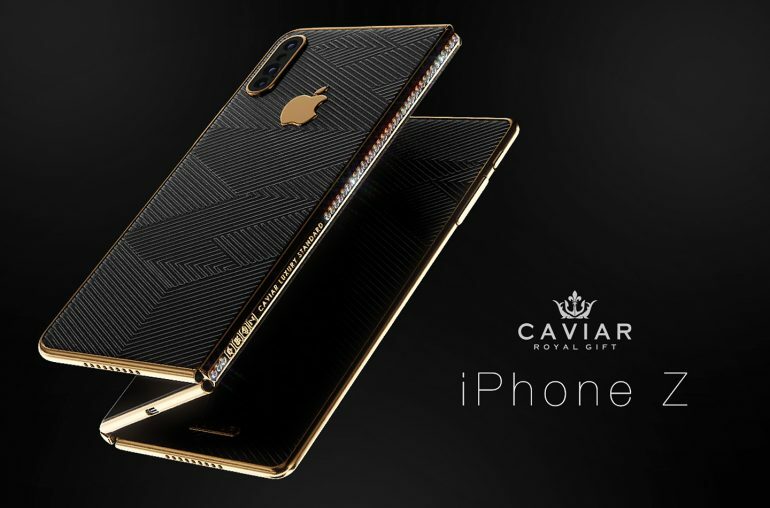 Caviar shows concept of a luxurious foldable iPhone Z that can fold twice, comes with a triple camera and has 90 diamonds hidden inside the housing. Many smartphone manufacturers are currently developing a foldable smartphone. Samsung and Huawei were among the first to introduce their version of a folding phone. Competitor Apple seems to need more time. Nevertheless the Russian manufacturer Caviar, known for their exclusive and luxury phones, came up with a concept of the foldable iPhone Z. The device has a 10.4 inch flexible display and can be folded twice. Caviar’s version of a foldable phone can be used in various manners. There is a selfie mode, a tablet mode, a laptop mode and a screen mode. 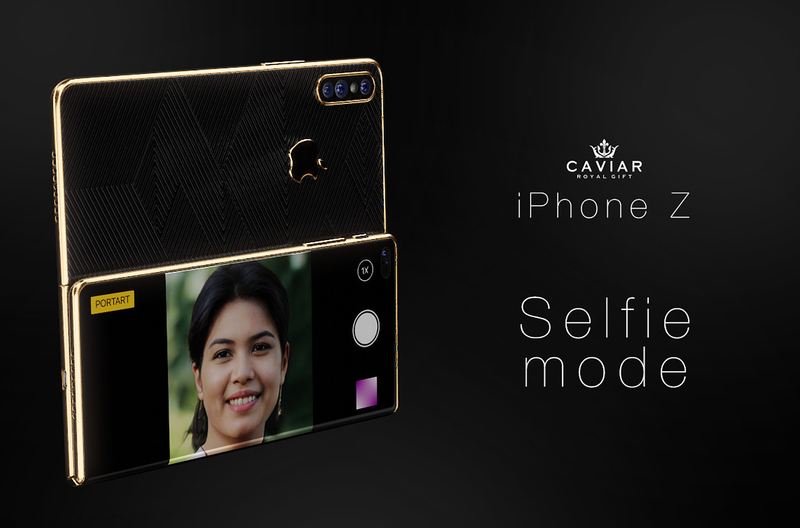 The concept by Caviar incorporates two cameras. 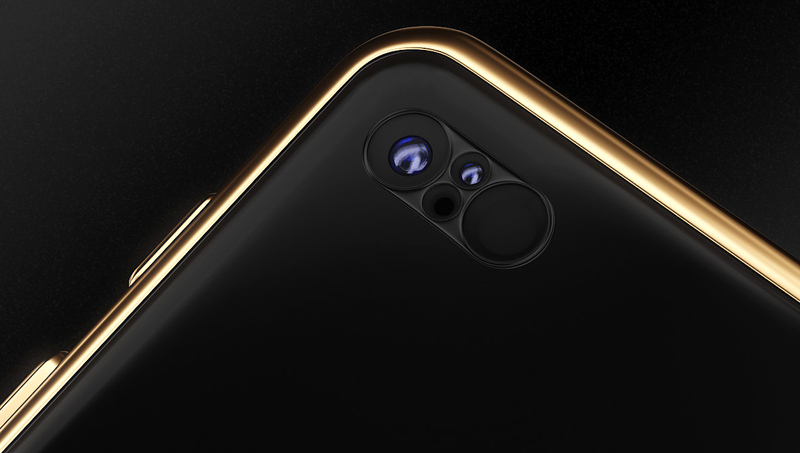 A front-camera with Face ID dot projector. And a main camera system consisting of a 15 megapixel wide- angle camera, a 15 megapixel ultra-wide-angle camera and a 15 megapixel telephoto camera. The foldable smartphone is equipped with an in-display Touch-ID (in addition to the possibility of Face-ID), because many iPhone XS users expressed their dissatisfaction with the absence of this option. In addition, Apple patented a new type of screen dactyloscopic sensor, that’s why Caviar engineers offer to use this technology in the new device. The concept by Caviar is also equipped with an USB-C connector, this way, the revolutionary device will become even more comfortable for the users. The information about the possible switch of Apple to this standard also appears in the reports of analysts. The design of the device presents an embodiment of the current luxurious Caviar style, an expressive alliance of black composite onyx (covering according to the technology Double Electroplated 999 gold content, 7 microns). 90 diamonds are hidden inside the housing, to see them you need to bend or unbend one of the parts of the smartphone. Caviar used a rushing graphical pattern interpreting a sharp “Z” silhouette, in which the screens are “fold”, and in the center of the composition, the image of the legendary gold apple is preserved. A representative of Caviar says: We really expect something amazing from the new Apple flagship and will not be impressed by any systematic updates! We, as the brand that has been working with Apple technics and their consumers for already 7 years, have our own ideas about it. We decided to dress them in the form of a concept and make it a public fare – probably, we’d be able to inspire Apple? We’ll send our progress to them. 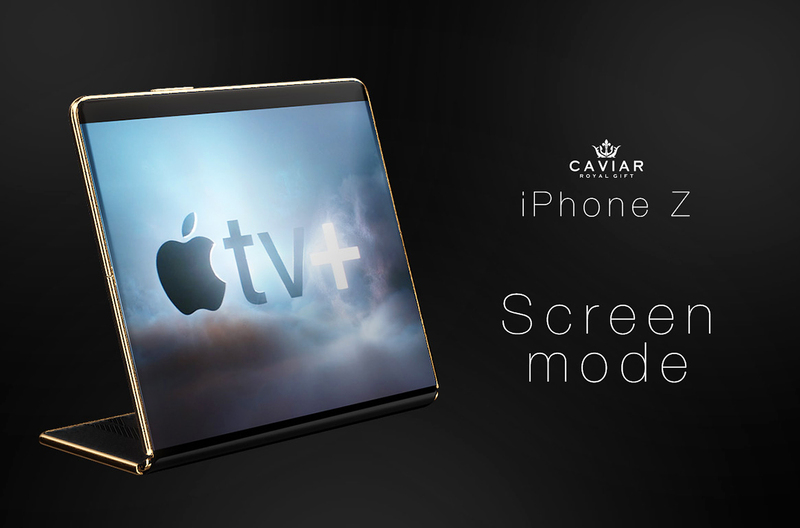 According to the estimations by Caviar, a foldable iPhone of this class will have a price of no less than 2900 EUR. At the moment, this is only a concept, but Caviar is open to suggestions from other manufacturers of smartphones for joint development of such a device.